Ford has announced a replacement for the Ka, called the Ka+. 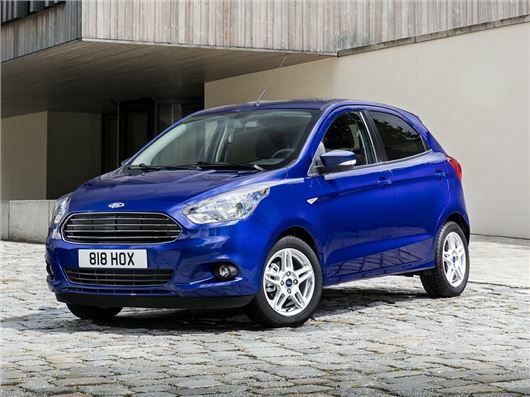 Larger and more practical than the outgoing model, it provides a value-for-money alternative to the Ford Fiesta. It’s available to order from June and is priced from £8995, with first deliveries due later in 2016. A 1.2-litre petrol engine will power all Ka+ models, but two states of tune are offered – 70PS and 85PS. Both variants have the same official economy figure of 56.5mpg with emissions of 114g/km. Entry-level Studio models will only come with the less powerful 70PS engine. Standard equipment includes electric front windows, front fog lights, Bluetooth connectivity, hill start assist and a speed limiter. The only other trim level – Zetec – gains 15-inch alloy wheels, manual air conditioning, DAB radio, and Ford Sync infotainment, along with cruise control and a leather steering wheel. It’s offered with either the 70PS or 85PS engine. Options include electronic climate control, heated front seats, tinted glass and a city pack featuring electric rear windows, power folding door mirrors and rear parking sensors. Boot space is 270 litres with the rear seats in place and Ford claims there is ‘best in class’ legroom for rear-seat passengers. There are 21 stowage areas in the cabin including large door bins and a secure storage box as part of the instrument binnacle, which can only be accessed when the driver’s door is open – handy for hiding valuables.